A detailed check of the foetal anatomy can be carried out at around 20 weeks, looking carefully at the brain, face, spine, heart, kidneys, bowel and limbs. This is the right time to rule out minor correctable conditions such as a cleft lip or club foot. Measurements will be taken of the head, tummy and long bones to check that the foetus is growing normally and in proportion. The placental site will be checked to ensure that it does not cover the cervix. 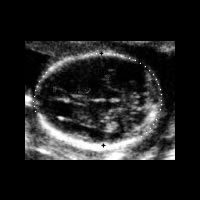 If it is a little low at this stage, a scan will be recommended at 32 weeks. Please note: That should the foetus be in an awkward position, a second scan may be necessary in order to complete the examination. In case of an abnormality being picked up during this scan, the foetal medicine consultant / sonographer will explain results fully and make referrals where appropriate. The scan is carried out from the abdomen and will take 30 to 40 minutes.